Before LSU students step foot in a classroom, they are encouraged to show their stripes. STRIPES is a four-day program that prepares incoming students for the transition to LSU by teaching them what it means to be a Tiger. These new Tigers earn their stripes by learning LSU history and traditions, meeting other first-year students, identifying opportunities to get involved, finding out about academic resources/support, and exploring the campus. 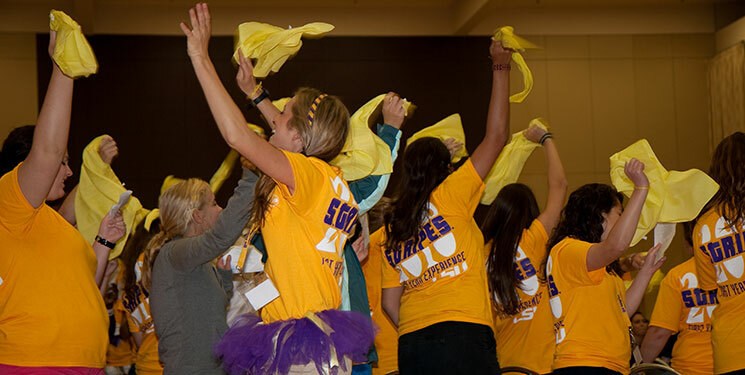 The incoming students play games and activities that test their LSU knowledge, hone their Cajun dancing skills, engage in a mock lecture with a faculty member, participate in bonding activities, and learn the alma mater. The program launched in 2000 with only 65 students. In 2005, alumnus Charles Barney made a game-changing gift of $1.1 million to expand the program, more than doubling its size. STRIPES now reaches 900 first-year students each summer. Students who participate in STRIPES have higher retention and graduation rates than their peers who choose not to participate. Though the idea of alumni giving began with the council, all STRIPES alumni are encouraged to contribute however much they are able to the program’s scholarships and activities.